When I asked readers of The Blog of the Bizarre to comment on their favorite magical creatures, a surprising number of you said banshee! Well, I have to admit the banshee is most certainly my favorite magical creature and with competition from the likes of werewolves and vampires that is saying something. Banshees straddle the world of ghosts and magical beings, fairyland and nighttime haunts. They are beautiful, mournful, horrible things. And I’ll bet we’ve all encountered one or two in our lifetime, perhaps without knowing it. Surely you’ve spent a lonesome night listening listening with trepidation to the howl of the wind. To the rattle of the windowpane and the thump upon the porch we say “’Tis only the wind!” To the squeak of the floorboards and the bang on the roof we declare, “This old house is settling!” But deep inside, and we have all likely felt it at one time or another, there is an uneasy understanding that something very supernatural is afoot. And the odds are this feeling of uneasiness is very likely accurate. Perhaps it wasn’t a banshee thought. There are many, many things out there clawing in the night, snarling in the shadows. Sinister beasts that make the sad Irish Banshee look friendly. They possess a certain dangerous quality that make the humble phooka or hyper goblin look positively friendly. Some tales recount that banshees are the ghosts of women who have died in childbirth; others say they are the restless spirits of unrequited lovers. They are almost always women, and they can and will invoke your sympathies when you hear their wailing. You could easily be lured into the dark of night, hoping to help the pathetic creature who sounds as if she is in mourning. One of my favorite bands as a young, surly teen was Siouxsie and the Banshees, whose front-woman Siouxsie Sioux is a gothic chantress who howled like a mythological siren—luring you with her tales of travel and woe. So when I came upon Elliot O’Donnell’s works about banshees I simply had to dust off the old vinyl (for you youngins’ whose main experience with vinyl is the sheath you keep your iPod Touch in, I am referring to a vinyl record) and paint on some heavy eyeliner so I could have a good ol’ fashion Banshee Bash. 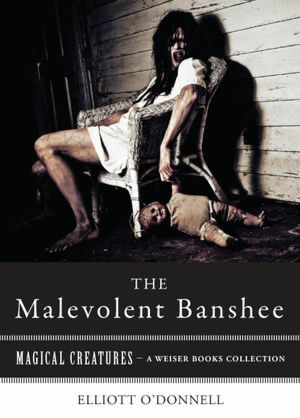 Enjoy these selections of O’Donnell’s best works on banshees, as part of Magical Creatures collection. And let me know your own banshee tales! I expect there is enough material out there for several volumes. This entry was tagged banshees, ebooks, magical creatures, Varla Ventura. Bookmark the permalink.